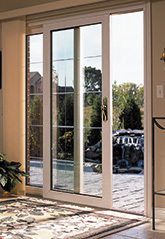 Window Source patio doors come in both double and triple panel models. All double and triple insulated glass panels come with code compliant tempered safety glass in all panes. The vinyl gliding panel frames are reinforced with heavy gauge steel to make your door strong and durable and features a full interlocking meeting rail.